I would bet that they will be the talk at the Easter dinner table this year. Yup…. I can feel it. How could everyone not find these Easter Chick Deviled Eggs to be one of the cutest ideas ever? We made these last year but, we did not have company over so I could not show them off. This year we will be having company for dinner and I am wanting my food to be fun, exciting and all the chatter ha ha. Ok, I just had myself one of these little chicks and I kind of felt bad eating him, ha ha! We have deviled eggs almost every holiday because everyone loves them. I find that most of the time they are the first item to disappear at a picnic, party or potluck. 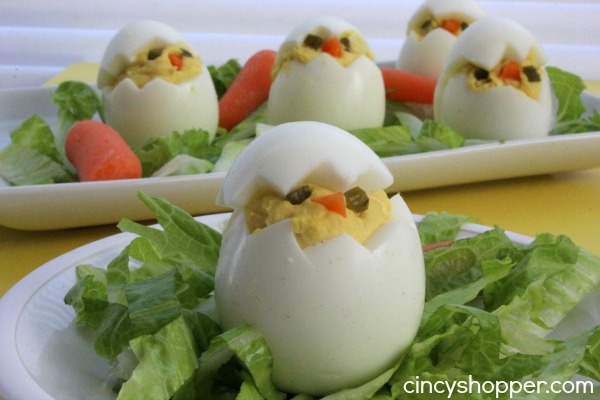 These Easter Chick Deviled Eggs are so simple yet they are just so special. Do you agree? lol. 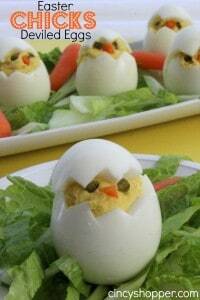 Just grab your ingredients for your favorite deviled eggs and you can whip up these special little chicks. 1 Sweet Midget Pickle or you can also use a few pieces of relish. Cut small slice off bottom off egg to flatten it so it will stand. 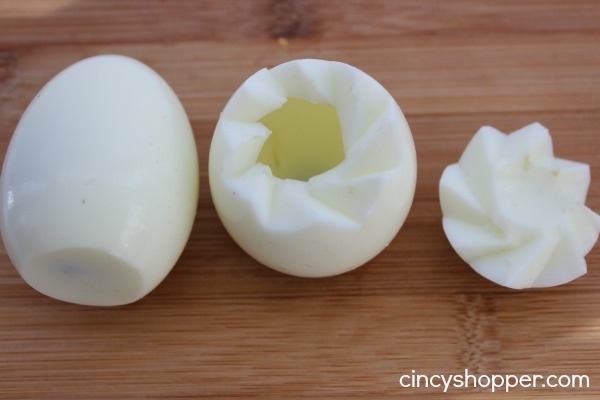 Cut zig zag pattern around middle of egg to look like it cracked open. Cut carrot so that you end up with 6 small triangles to use as beaks. Cut strip off of pickle and then make 12 small squares to use as eyes. Pipe mixture into cooked egg whites piping until over full to resemble a chick head sticking out. Place beaks and eyes in place. Top each with the bottom with its top half. You can optionally shred lettuce to resemble grass to display them. 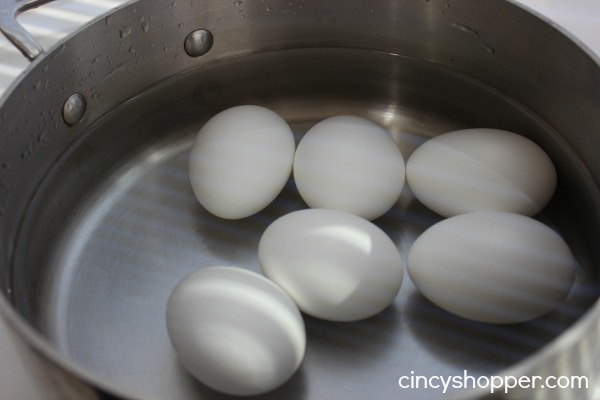 Some of your eggs may split a bit when removing the yoke. Have no fear as they will actually hold together better once you fill them with your yoke mixture. If you are making your Easter dinner list, definitely consider making these lil chicks. They are so simple and quick. Oh… they have the WOW factor too! Those are so cute! I may have to give them a try if for no other reason than to post a photo of the finished product on FB hahaha! Hi Lydia! Be sure to let me know if you make these cute little chicks. I would love to see yours. I think they are so darn adorable. They just instantly create a good mood. These are too cute!! I can’t wait to make some for our next family gathering :) If you get a chance, stop by sometime and link up to our Snickerdoodle Sunday!! These are absolutely precious! So creative and cute! So cute! I’m making a tray of these for the Easter egg hunt we’re having on Palm Sunday. Too adorable. Thanks for sharing. 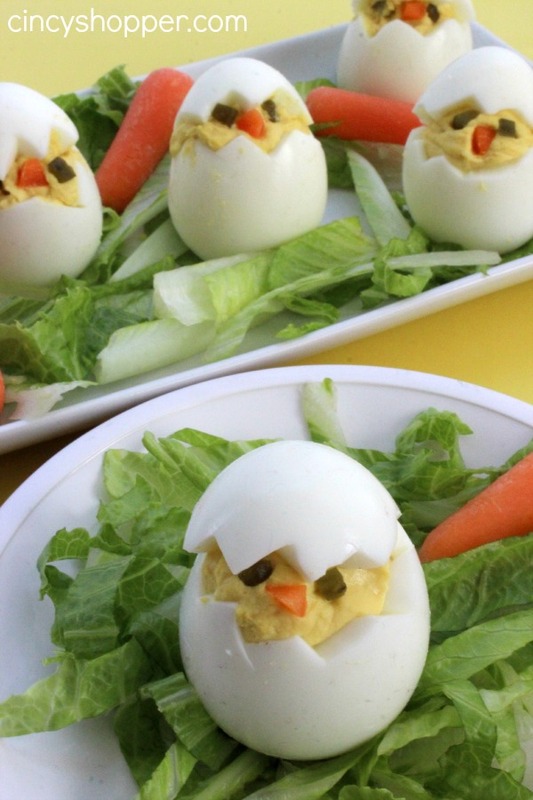 These are so adorable and I can’t wait to try them out on my daughter who adores deviled eggs! Great Eggs, very special for Easter! Happy St. Patrick’s Day to Ya and thanks so much for sharing your awesome post with Full Plate Thursday! I love these how fun! That is completely adorable! Pinned it in my Easter boards! Happy Spring! The pretzel eggs and the twine eggs are so cute. Think we’ll make these at school. Thanks for the great ideas! Pattern on the eggs. This maybe a crazy question. 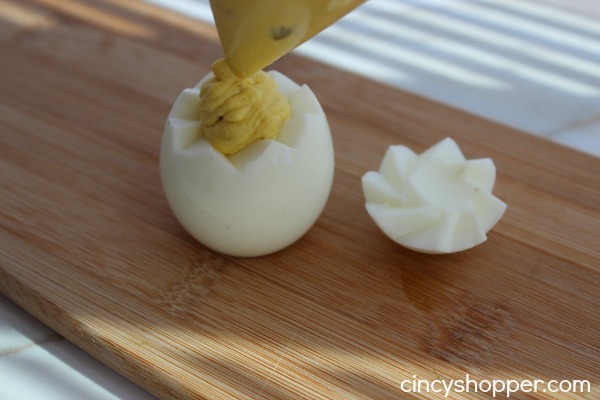 These are super cute and I tried them, but I need tips because I could not get the yolk out without cutting the egg in half too!. I tried making these today and it was much harder to do than it looks.All the eggs fell apart. I THINK I WILL USE RAISINS FOR THE EYES! I LOVE THESE LITTLE GUYS! These little eggs are so adorable. Very cute! 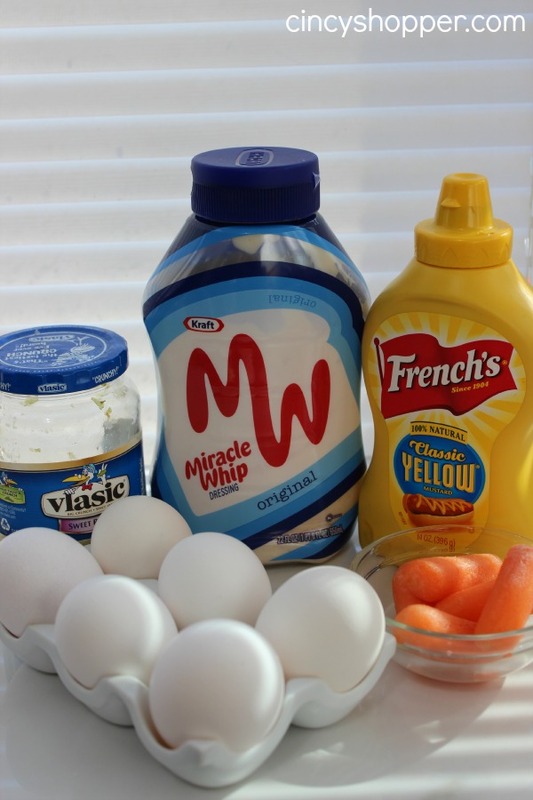 FYI “miracle whip” is not mayo. Use Hellman’s; Miracle Whip is gross.